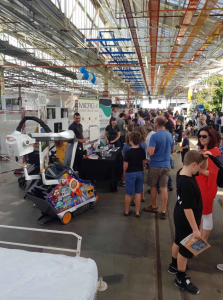 On 24th March 2019 Tonsley held an Open Day in conjunction with Science Alive Week. It was an event attended by 6000-8000 people. The open day was a free event and gave members of the public the opportunity to see, hear and touch the technology being developed at Tonsley. Micro-X held a stand and showcased our Carestream DRX Revolution Nano and images of technology being developed. Our stand was manned by our passionate team who were excited to talk to everyone who stopped by about all things Micro-X.